Now you can look like El Toro! Just imagine yourself strolling through the mall with these cherry shades. You'd be the hippest hipster around. 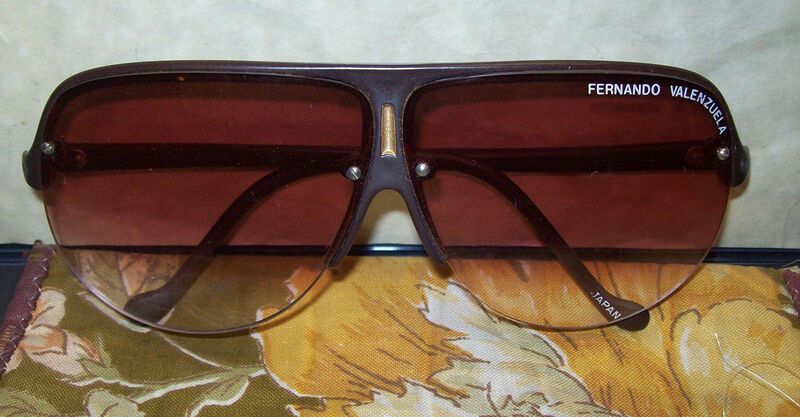 These frames scream the 1980's like bright white stone-washed jeans and fluorescent colored shirts. And from what I understand that's all the rage these day, ain't it? At least that's what the young-folk tell me today. Featured above is something truly majestic, so take a close look. 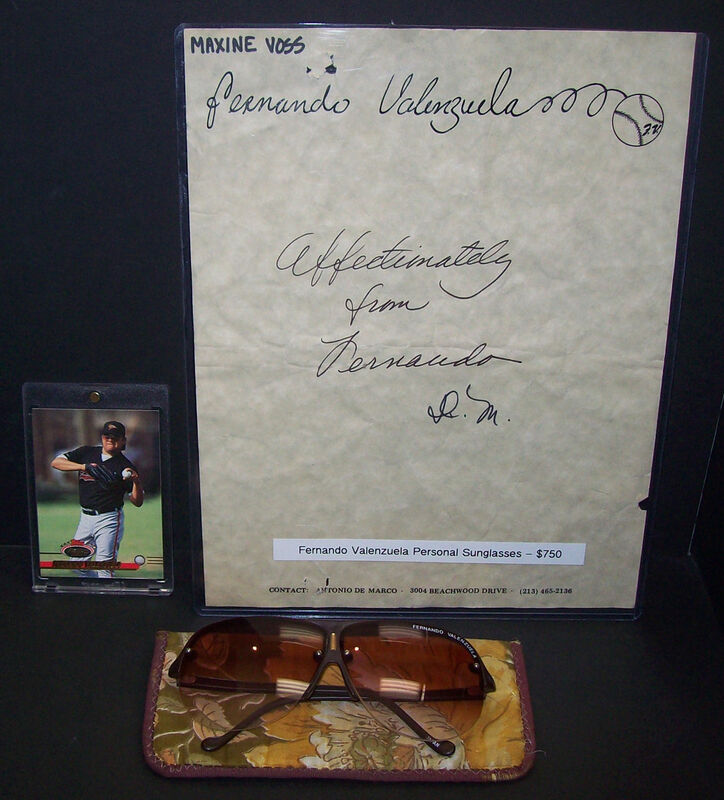 In addition to the 1958 Dodgers' scouting guide I wrote about yesterday, the same seller also has the above original pair of sunglasses that were once worn and owned by Fernando Valenzuela. It is of the rose/red lens variety and includes Fernando's name monogrammed along the rim. Check out the auction here. It comes from the collection of Maxine Voss - who was the personal assistant to Dodger GM Al Campanis during his final four years with the Dodgers. She had been with the Dodger organization for eleven years, and is noted to have been on the Board of Directors of the Campanella Foundation. As for the sunglasses they come with a note on the letterhead of Valenzuela's agent Antonio DeMarco gifting the specs to Maxine Voss. Check that out below. 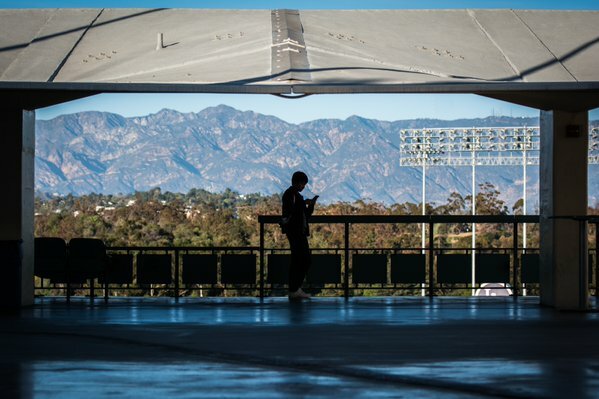 Just another photo of an fantastic day at Dodger Stadium, as tweeted by the Dodgers yesterday. Via Jon Weisman at Dodger Insider, "Dodgers offseason update from Andrew Friedman." There are tons of great questions, so be sure to read them all. "I always make adjustments to the lineup," Greinke said on MLB Network. "But I think Kershaw showed this to me the best. If you have something going good ... He does, and doesn't mess with them too much, and everybody sees how that works for him. I try not to think too much, and if you have a good pitch, use the good pitch, and you don't have to fool people that much." Via Joel Sherman at the NY Post, "Whopping tax bills come due for Dodgers, crunched Yankees." Tommy Lasorda will receive an honorary Doctor of Humane Letters degree from LMU today. Find out more here. Sources: #Dodgers have hired international scouting executive Ismael Cruz away from #BlueJays. Eric Stephen at True Blue LA shares some background on Ismael Cruz here.